A little twist on our popular poesy rings, this time with your special message, date, word on the INSIDE of the ring! Sterling silver 4mm wide band can be custom ordered in your size. ANY size! Not sure of your size? Just contact me to learn how to figure finger size. Maximum characters outside 12, maximum characters inside 12. (This limitation is due to the fact that stampings cannot overlap one another inside to outside). Fonts that work well with this size ring are designer font, block lettering and typewriter font. Need more than one ring? No problem! Just contact me. Please allow up to 3 weeks for completion. Absolutely love my ring. High quality, and seller was easy and a pleasure to work with. Very happy! Thank you! Great necklace. I pretty sure my kids think it’s pretty cool too! Beautiful ring. very well-made! ! Just a bit of background, this is my second purchase from this seller. 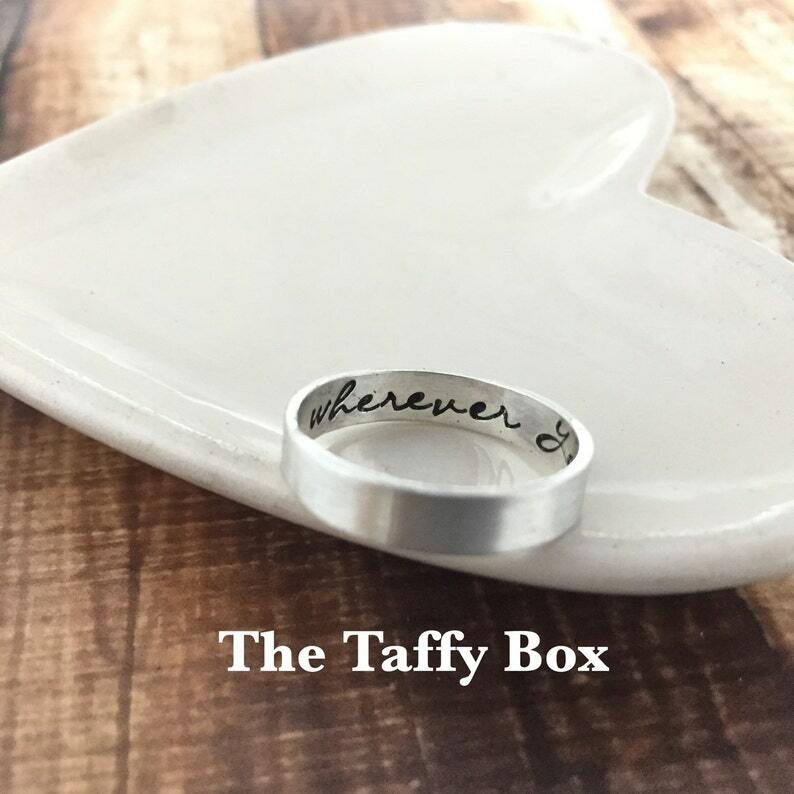 I bought a hand stamped ring from TheTaffyBox over 9 years ago and I've worn that ring every day. It still looks like it was just stamped. Other rings from other people I've purchased from, the letters faded or got worn down pretty quick. That should be a testament to the quality of her work. 9 YEARS daily wear and still looks like new. :-) I'm certain my latest ring from her will have the same durability. Thanks TaffyBox! Credit Card and Paypal payments will ship items same or next day unless they are e-check payments, which must clear first as per Paypal policy. Custom requests take 10-14 days to create. If your Paypal address is different than your Etsy ship to address, you'll need to go into your Paypal account and change this for your transaction with me. This prevents unscrupulous shoppers using your credit card to buy items and have them shipped to their own address. Refunds are accepted if item is damaged in the mail and insurance had been purchased by the buyer. If you receive an item and are truly dissatisfied, I will work with you to try and make it right. Please convo me immediately if this is the case. Please understand that hand made items are just that. Hand (not machine) crafted, and may not be exactly perfect in size or spacing. This is what crafters see as being unique about their items, that they are not cookie cutter or exact duplicates, and that no two items are going to be alike. Exchanges of non-custom are welcome for store credit. Thank you for understanding. All items are shipped USPS First Class Delivery, and packaged securely in double padded bubble wrap, and if valued at more than $20 will generally carry tracking and delivery confirmation. I try very hard to do a quick turn around time from when you order, however, I do not carry all crystal colors and shapes in stock because there are so many. I will let you know if it will take more than 14-21 days to ship you item in the event that I need to special order a crystal or a charm for you. If your item is breakable (wine stoppers, glass beads, etc.) may I suggest insurance be added for $2. If you would like insurance, please let me know via a convo and wait for an adjusted invoice prior to paying. Shipments are made next business day following receipt of payment (read payment policies above) unless they are a custom order which will take 14-21 days. Shipping times are above this estimate. Unfortunately I have no control over the handling after your item leaves my hands at the post office so if it is breakable, please cover your item with insurance if it is breakable. International shipments cannot be tracked or insured. I can provide proof of shipment to your destination only, however, international losses, which may be the result of customs interference, weather delay or vandalism cannot be the responsibility of The Taffy Box. If there is a problem please contact me before leaving feedback so we can try and resolve it. Coupons received and used after your first purchase are good only on your next purchase and not on bulk or web store orders, which are usually already discounted. On occasion I may need to substitute crystals, drops for bic-cones or visa versa. If you absolutely positively do not want any substitutions on your order please let me know. This is a rare occurrence.